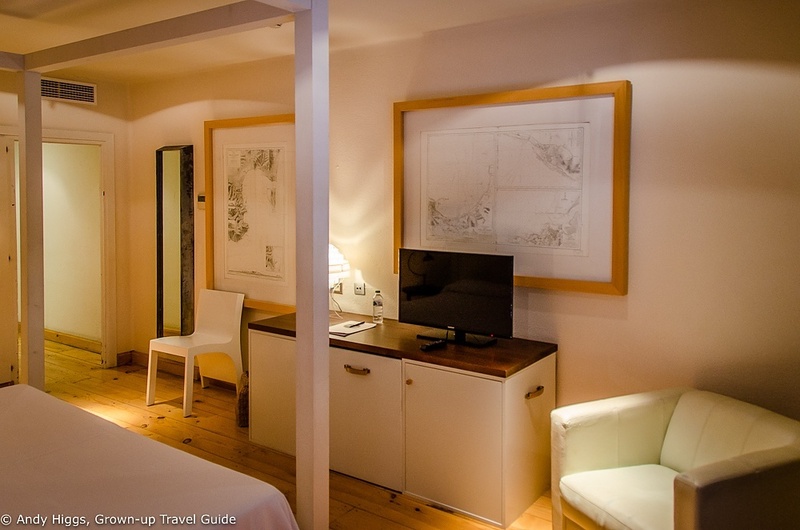 For our second night on the Costa Brava as part of a blog trip we moved to the Hotel Trias in Palamos. 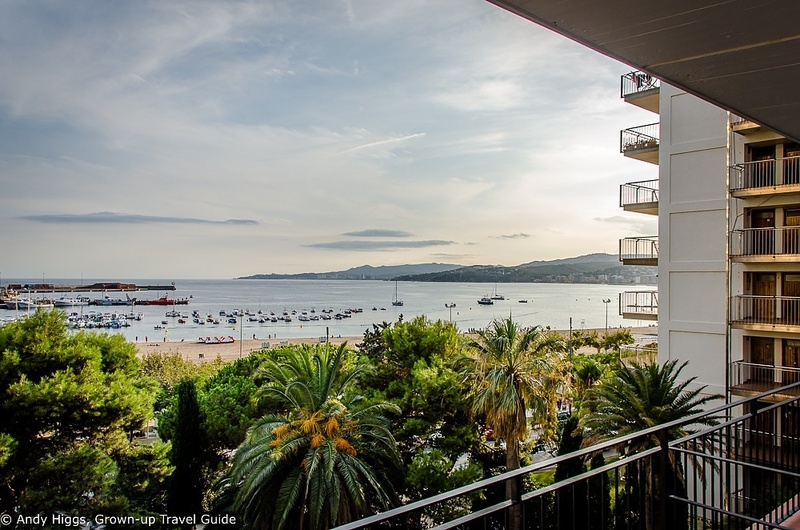 It’s a lovely port town with great tapas restaurants and stunning beaches close you; click here to read more about Palamos. As usual there was too much to see and too little time but I certainly experienced enough to want to return to the town and stay here again – if only to get the chance to make use of that beautiful pool. Three stars. Re-opened June 2005 after complete renovation. 82 rooms over 7 floors. 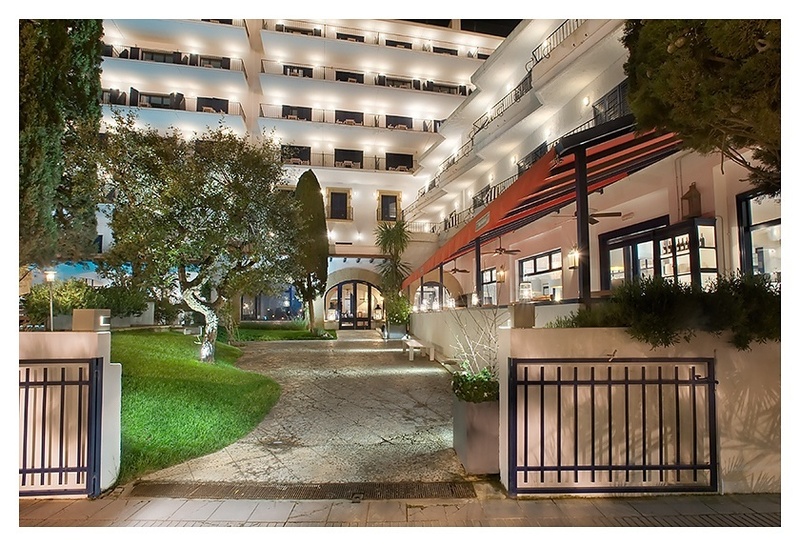 The Hotel Trias is located on the seafront over the road from the beach. 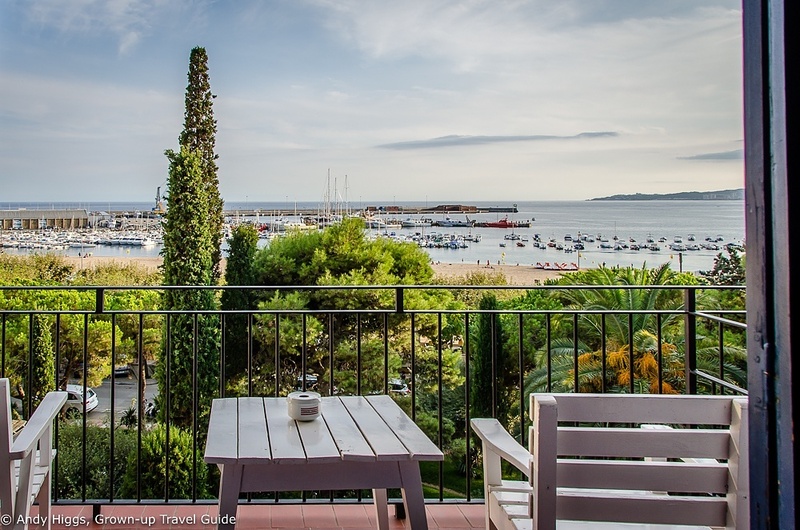 The city centre is just a few minutes walk away and many rooms have great views of the sea and harbour. There are plenty of paid car parking spaces on the streets around the hotel and this can end up being rather expensive. 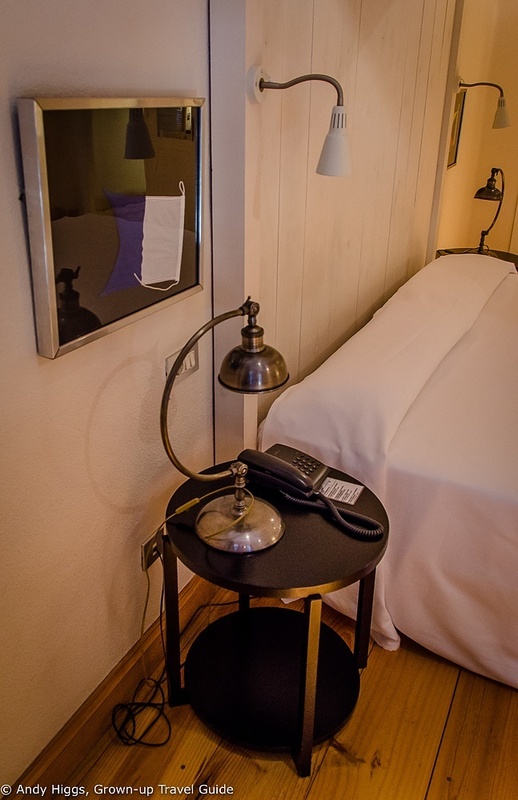 The hotel offers a limited number of spaces for a charge of EUR 15.80 per day. Apart from the excellent location and sea views (assuming you book a room at the front of the hotel and on a higher floor) the Hotel Trias is known for its celebrity guests – both Ava Gardner and Truman Capote stayed here in the past and some locals refer to the Trias as the “Hotel of the Stars”. 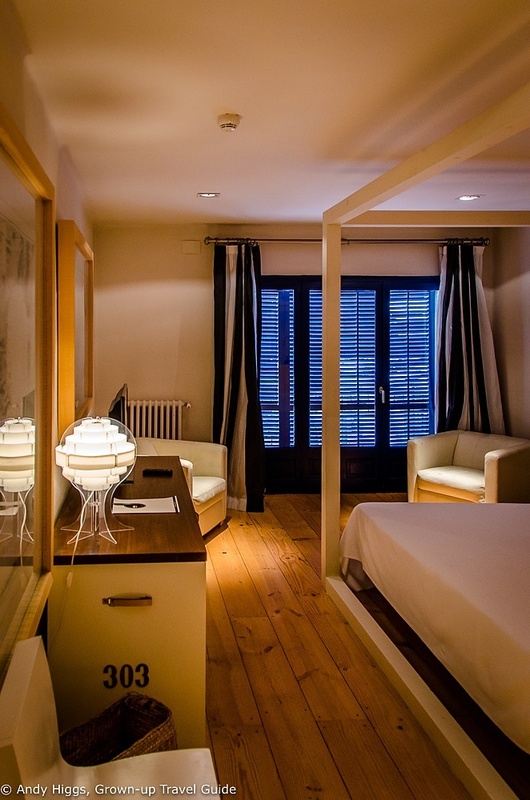 But that’s not all – despite boasting a relatively large number of rooms the Hotel Trias feels very much like an intimate boutique hotel and is very stylishly designed. Yet it’s laid-back atmosphere is also enticing and makes it popular with families. The pool is a great draw, and the bar and restaurant have a good reputation too. 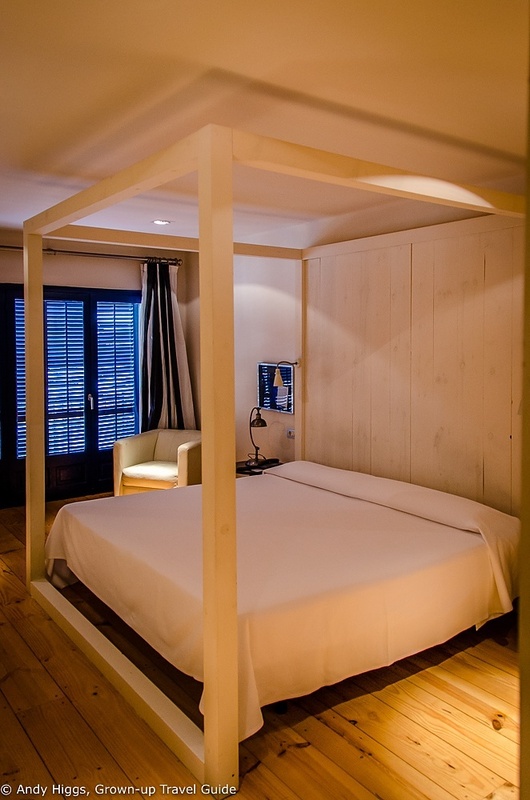 Last but not least, the rates are very reasonable for such large and well-equipped rooms. 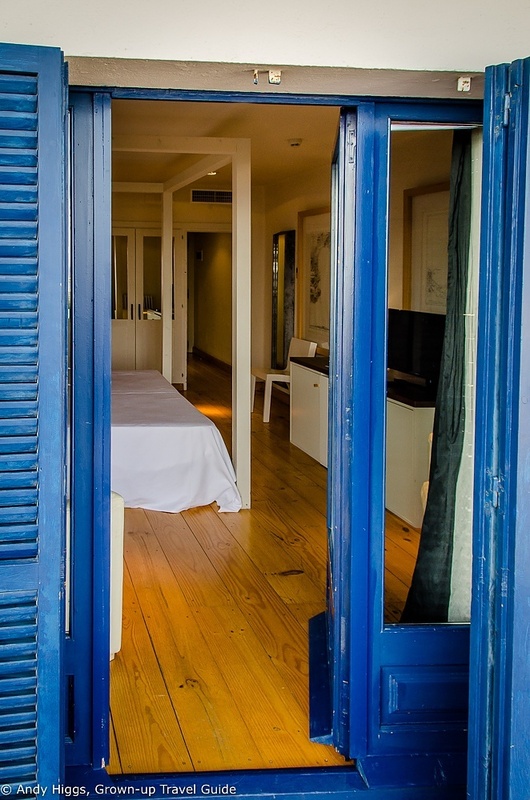 There are three categories of room: standard, swimming pool view and sea view (all are double rooms), as well as two junior suites. I stayed in a sea view room (number 303, on the third floor) with a good-sized balcony and a sea view. 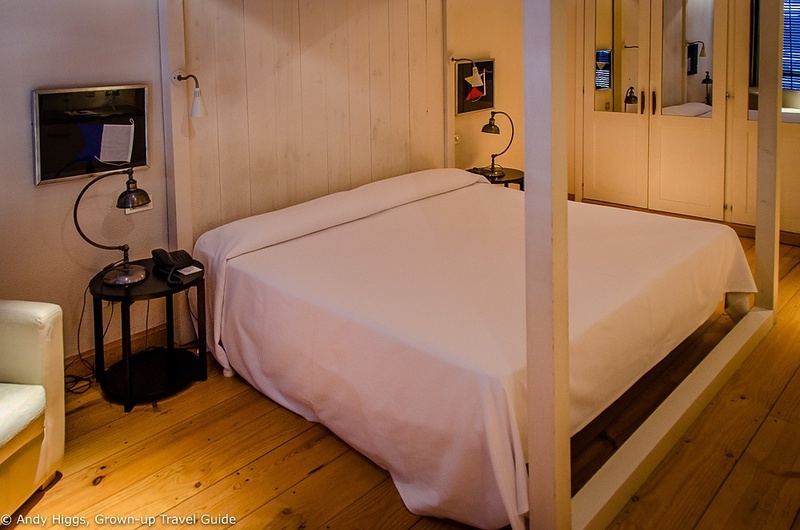 The room was large, light and very attractive with a huge bed. As the video and pictures show the room was spotlessly clean, light and airy with plenty of storage space. The bed was supremely comfortable – in fact it was probably one of the best hotel beds I’ve slept in. I liked the design with its mix of the old and the new as well as the maritime style. Theis is more of a leisure hotel than a business one, so there was no desk as such to work at although I did make use of the surface here for a quick email check. There were enough power points to meet my (above average) requirements too. A flat-screen TV was provided but I didn’t bother checking the number of channels or anything; I would imagine the selection was pretty standard. 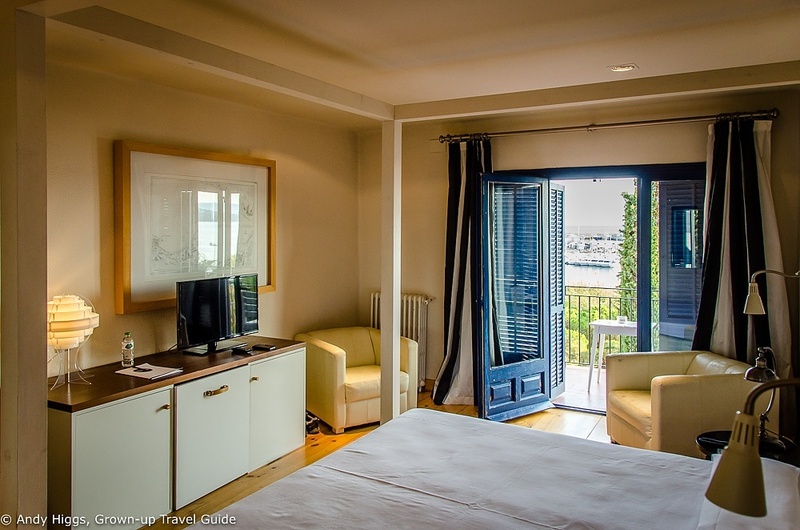 With the balcony doors open the room was flooded with beautiful natural light. Two cosy armchairs were perfect for relaxing and the room also included a safe, telephone and both heating and air conditioning. It seemed difficult to imagine needing the former but the latter was welcome. 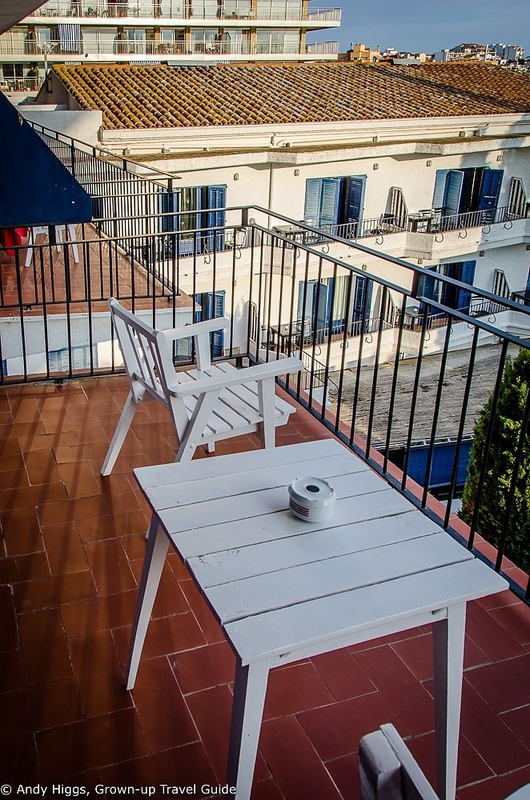 I loved sitting out on the tiled balcony with a cold beer and taking in the view. The pool was extremely inviting but time was against me, unfortunately. No! 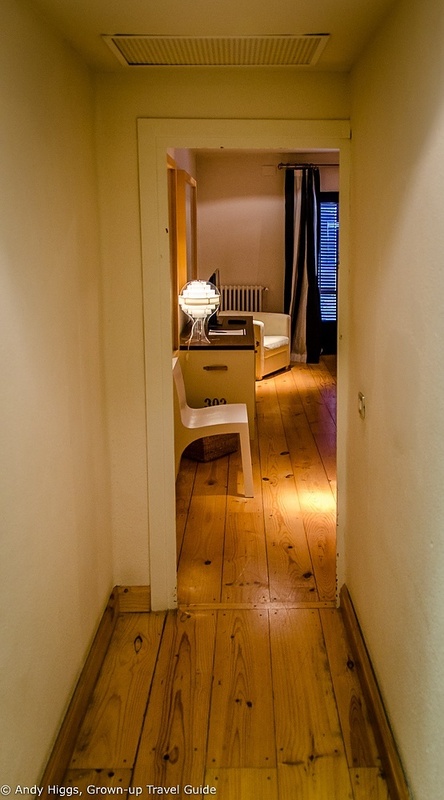 Beautiful polished wood floors, as you can see. Is there anything better? 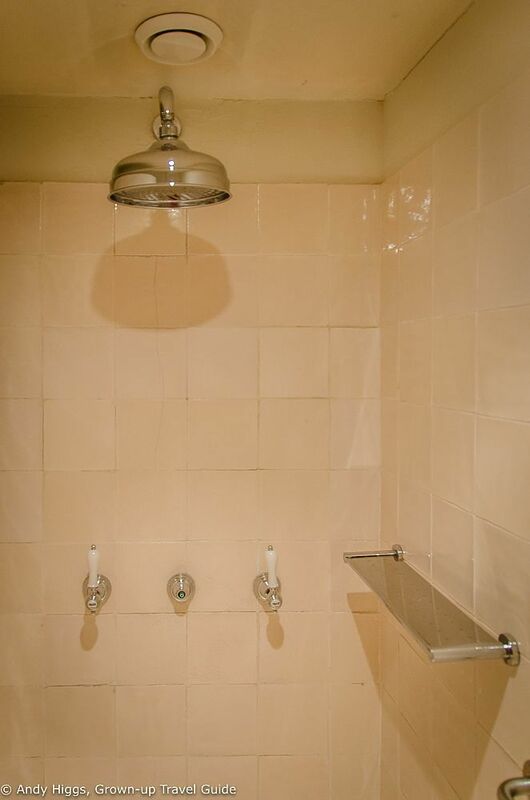 The bathroom was also large with separate toilet and shower areas. And a very cool washbasin. 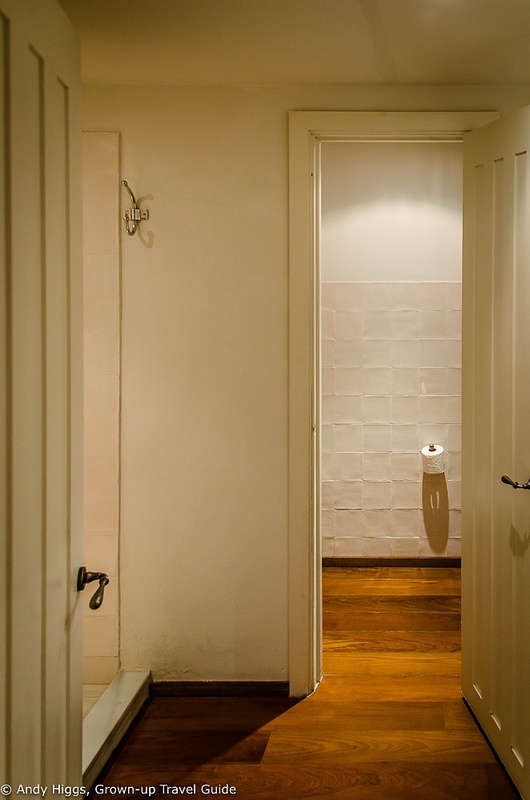 Toilet straight ahead, shower to the left. 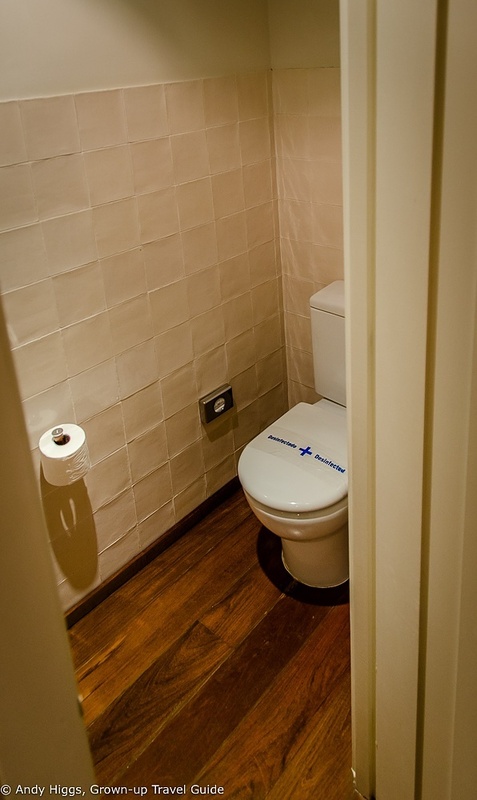 It still strikes me as odd that the majority of Spanish hotels continue to bother with the label on the toilet seat, but there’s probably a law about it or something. 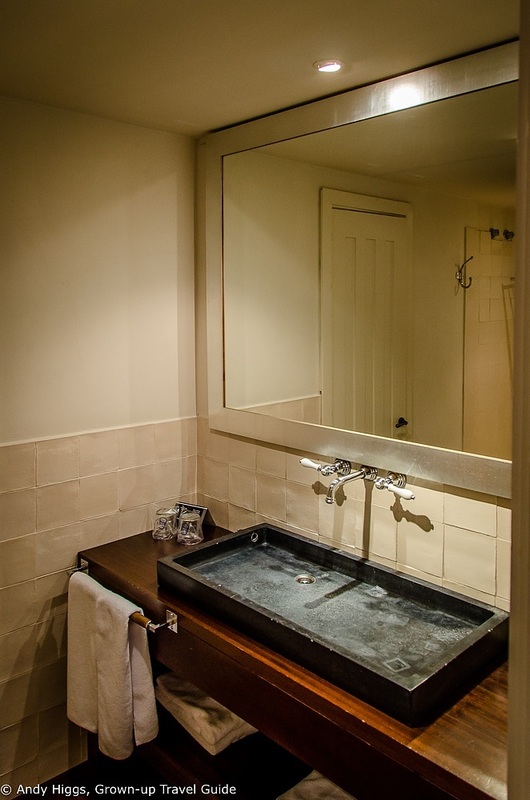 The water pressure was good and I loved the taps – and the fact that the shower area was spacious. 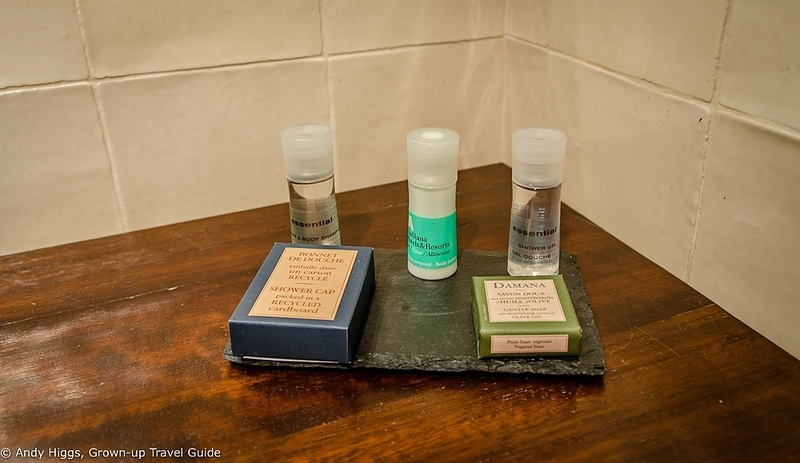 Good quality toiletries were also provided. Yes, the wi-fi service is free and and of excellent quality throughout the building. 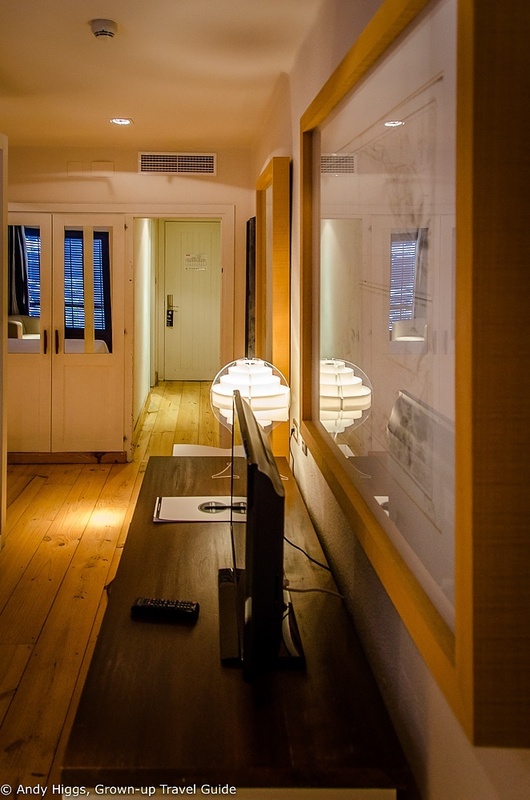 A free wired connection is also available in the rooms. The hotel has a restaurant serving local cuisine but we didn’t have the opportunity to eat here. It has made a good name for itself, though, and is popular with both visitors and guests alike. 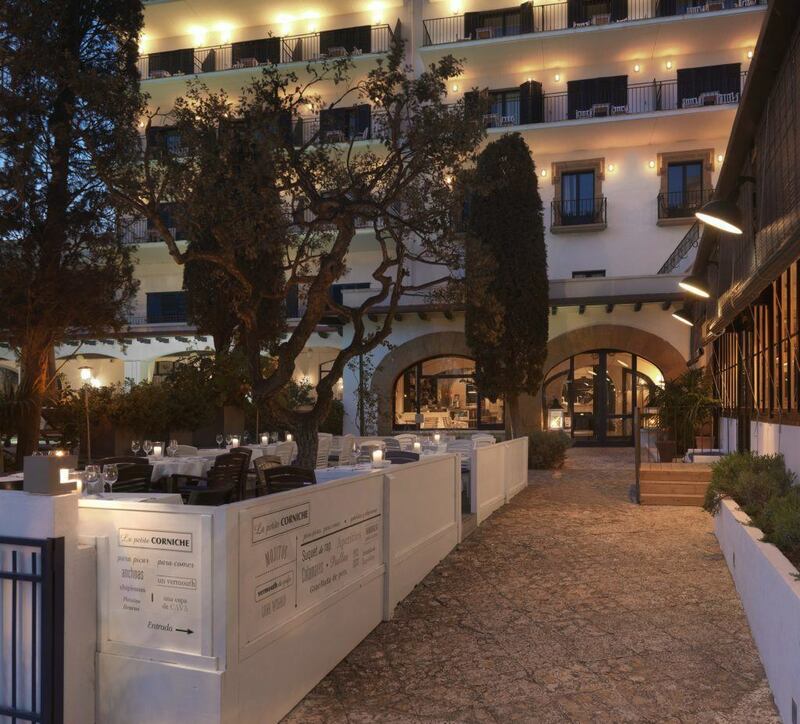 There are two bar areas, “La Corniche” with pavement-side seating and “Ruark” inside the hotel but opening onto the pool area. 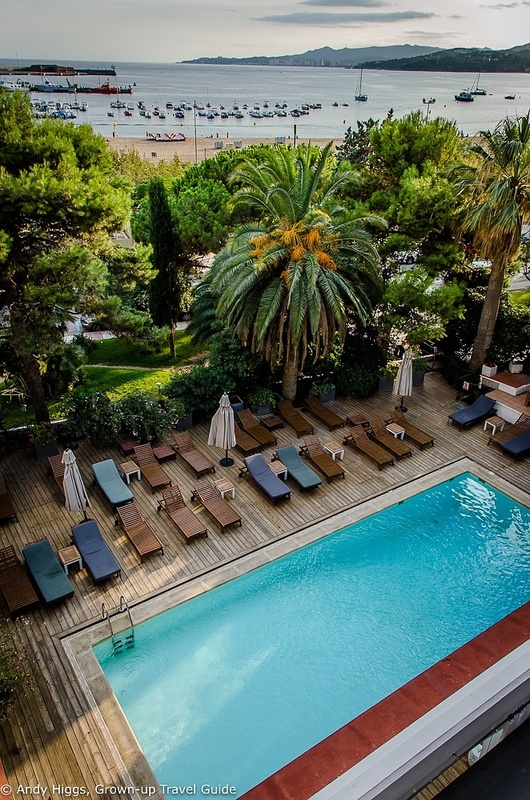 Yes – the Trias has a lovely outdoor pool. As mentioned, we didn’t get the chance to take the plunge but it looked great. A fantastic buffet breakfast is included in the rate and might almost warrant staying here on its own. An extensive selection of hot and cold dishes, local specialities, juices and coffee is available, and I recommend allowing plenty of time to make the most of it. Service was excellent at all times, both at reception and during breakfast. No. Hotel Trias is part of a small chain but not part of any loyalty scheme as far as I could discover. 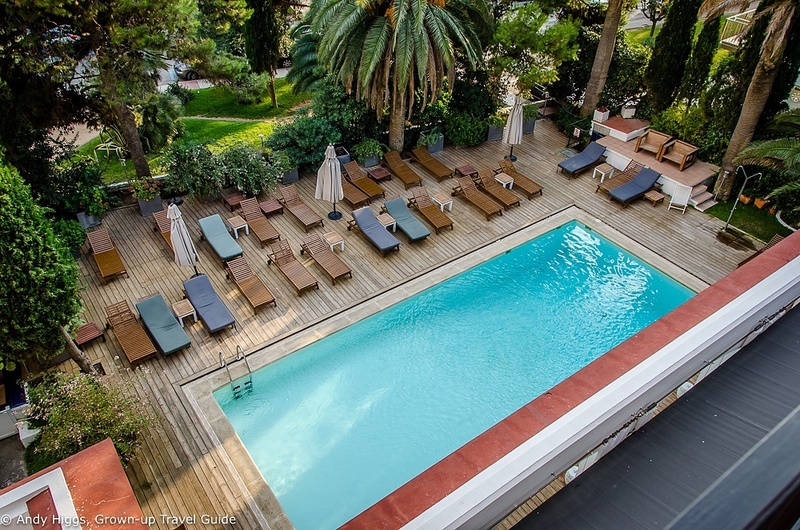 Low season rates start at around EUR 62.50 per night for advance booking with breakfast; during the summer these rise to around EUR 185 and sometime involve a minimum 2 or 3 night stay. Prices are somewhat lower for sole occupancy, and a little higher for swimming pool and sea views. Excellent location. Lovely views from upper, front-facing rooms. Modern, stylish and clean property. Wonderful beds. Fantastic breakfast. Lovely pool. Top service.